Luther Muhammad came out with something to prove against Penn State Thursday, and showed out with 20 points, five rebounds, four assists that included going a perfect 8-for-8 from the free throw line. Andre Wesson also had a nice game with a double-double of 15 points and 10 boards. 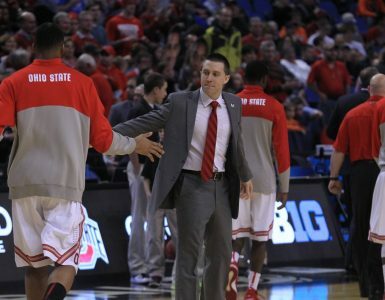 Strong performances all around led the Buckeyes to a 74-70 victory over the Nittany Lions. Against Indiana Saturday, the Ohio State offense looked anemic to say the least, but they got the job done. 55 points from the Bucks was the second lowest total of the season, but Andre Wesson came out with another strong performance of 15 points and four rebounds to lead the team to victory. Kaleb Wesson was notably quiet by his own standards, with only 10 points and four rebounds. Nonetheless, the Buckeyes secured the 55-52 victory by holding the Hoosiers under 40 percent shooting from the field and outrebounding them 35-29. The team’s next game comes against Illinois on Thursday, Feb. 14. A middling week has come to be right about what we expect from the 2019 iteration of the Ohio State women’s basketball squad. On Wednesday, the Bucks hosted Penn State and put up a fantastic offensive performance that propelled them to a 78-73 victory. Janai Crooms put up 20 points, Makayla Waterman dropped 19 and Carmen Grande and Dorka Juhasz each put up 14. Juhasz also returned to double-double form with 11 rebounds. On Sunday, though, the team was totally different. They were shut down 78-52 by the Iowa Hawkeyes. Four Buckeyes scored in double digits, but none put up more than 12 (Dorka Juhasz) and the team was held under 30 percent shooting from the field. Juhasz also had another double-double with 10 boards, but no other Buckeye grabbed more than four. Ultimately, Iowa held Ohio State to one of its worst offensive performances of the season. The team’s next game comes @ Rutgers on Thursday, Feb. 14.